…….not happening – at all. 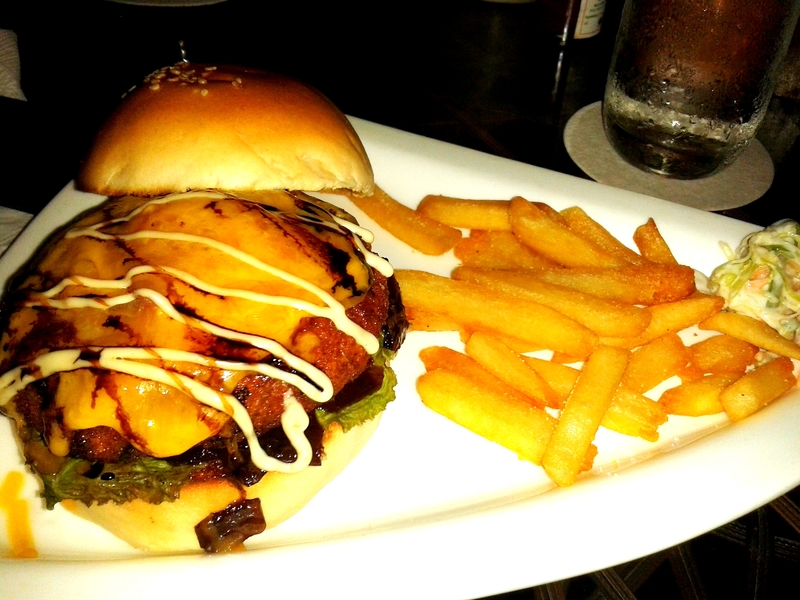 Went to Ellipsis for dinner last night, with hubby. Again courtesy Restaurant Week. Its a restaurant I’ve been wanting to visit. I’m glad that I went and I’m over it. I always wanted my blog to have good things to say about food, but Ellipsis really really let me down – Big Time. Due to some religious reasons, we ordered only a vegetarian fare. 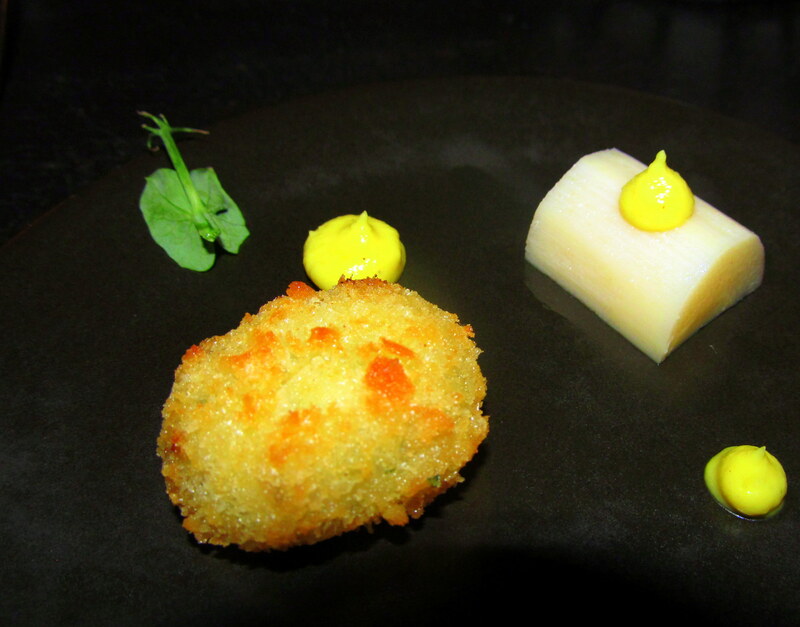 While we waited for our first course – the salad, we were each presented with a small plate with 1 cheesy fried dumpling – it was nice. The meal started off well. 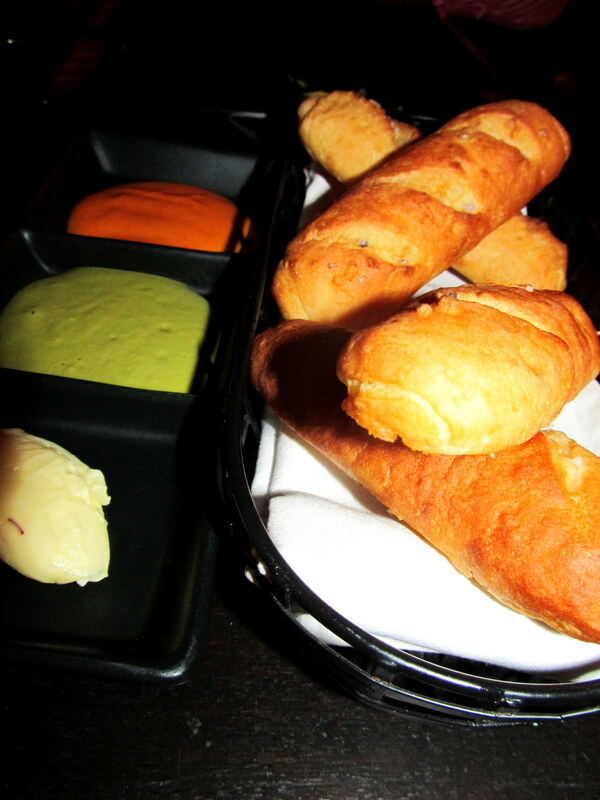 They then offered us a bread basket with flavoured butter, honey miso and smoked pepper dips – the dips were really good but the bread was chewy. Both these were complimentary while were waited for the salad. The salad arrived – looked fantastic. 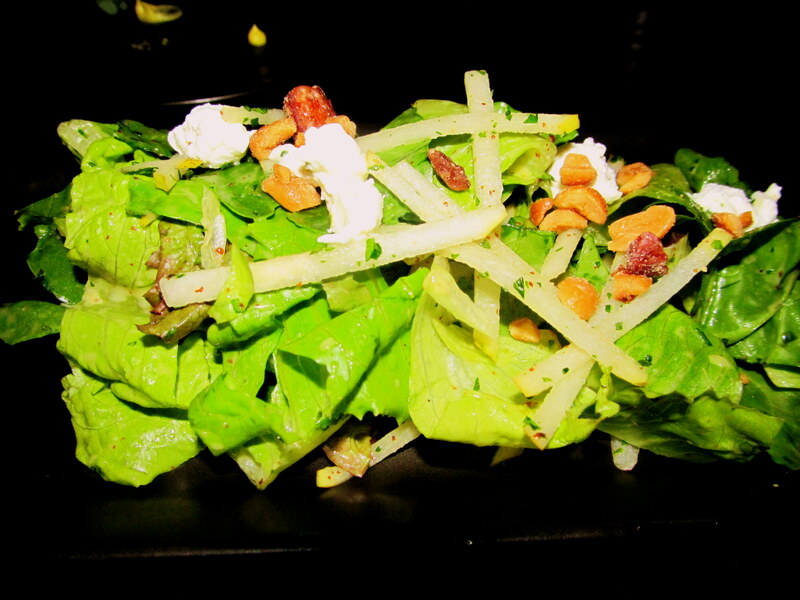 It was a spinach salad with spinach, arugula, caramelized and roasted nuts and goat cheese, It was great. So goooood. I thought to myself – great place to have come. But then, the salad was the highlight of my meal. This was followed by the Second course – the appetizers – we had to choose one each. 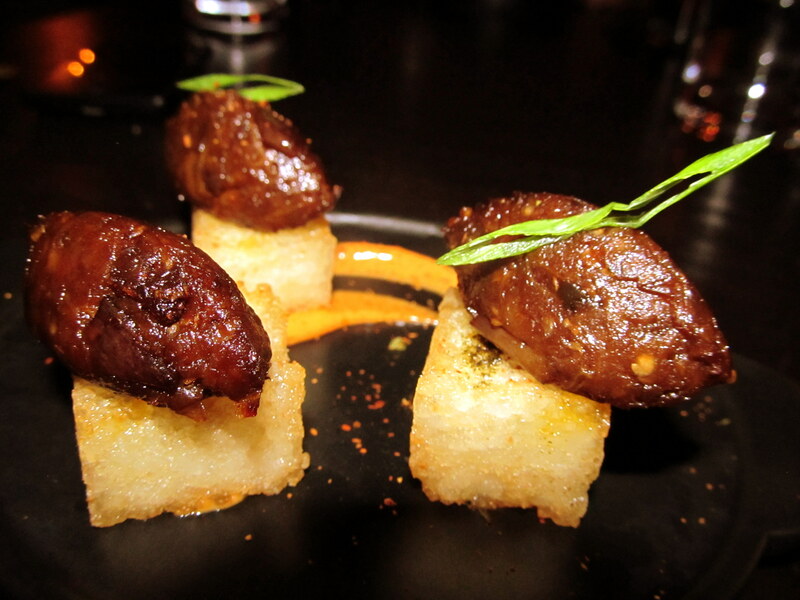 I chose the aubergine starter – (eggplant, chilies, soy and crispy rice). 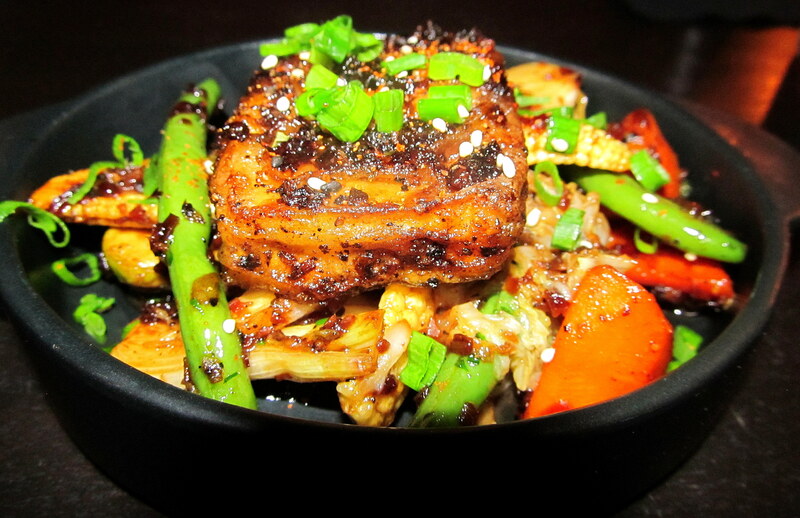 Hubby selected The Tofu bowl (garlic, sesame and fall vegetables). We exchanged the plates. 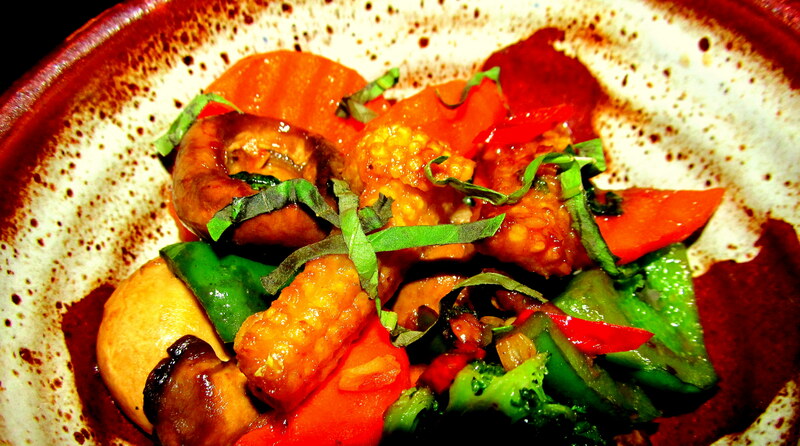 My feedback – NO to the aubergine starter. The Tofu bowl was really good. 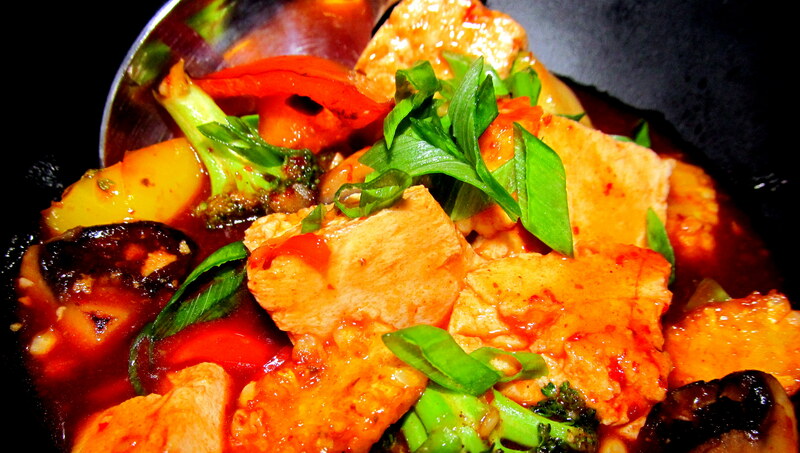 Hubby’s feedback – The Tofu bowl was decent. Reminded him of Chinese-styled cooking. Found the aubergine starter better. 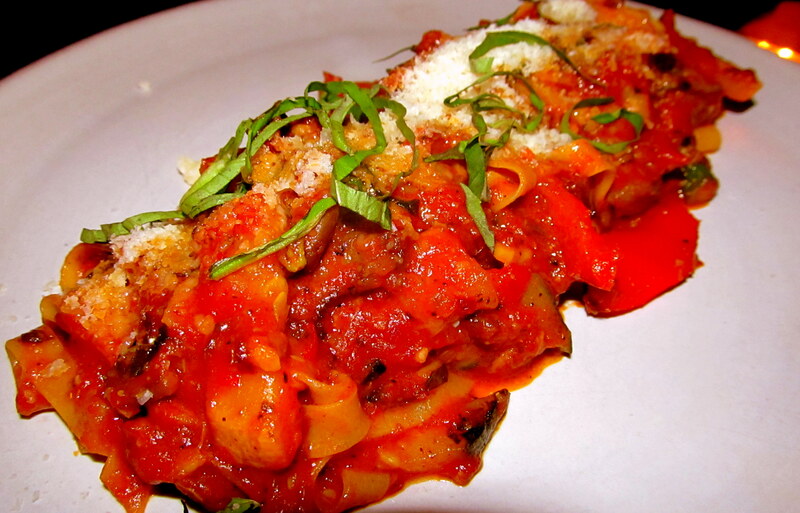 Main course was Fettuccine – house-made pasta, grilled veggies tossed in marinara. 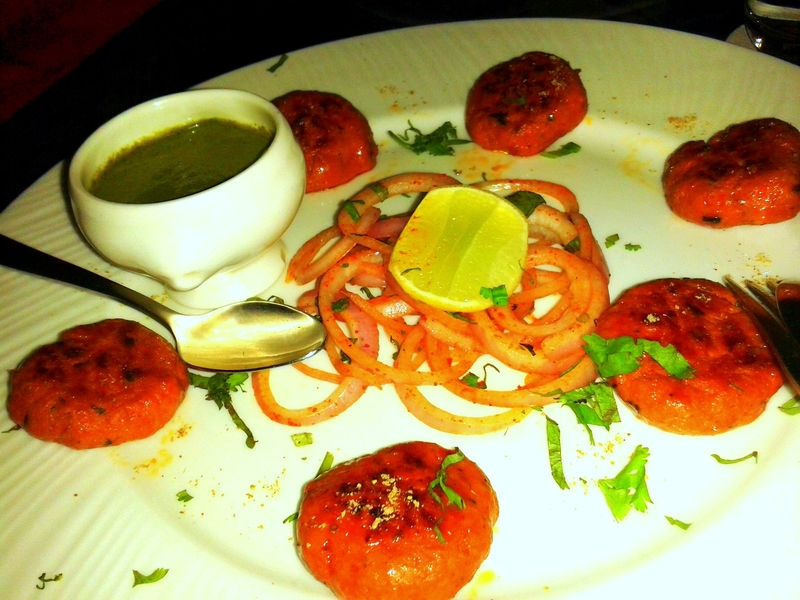 Our verdict – decent but too much of marinara which gave a very tomato-y taste to the dish. Finally we were ready to order the desserts. We were really hoping the desserts would uplift our mood. How our moods crashed – shattered! 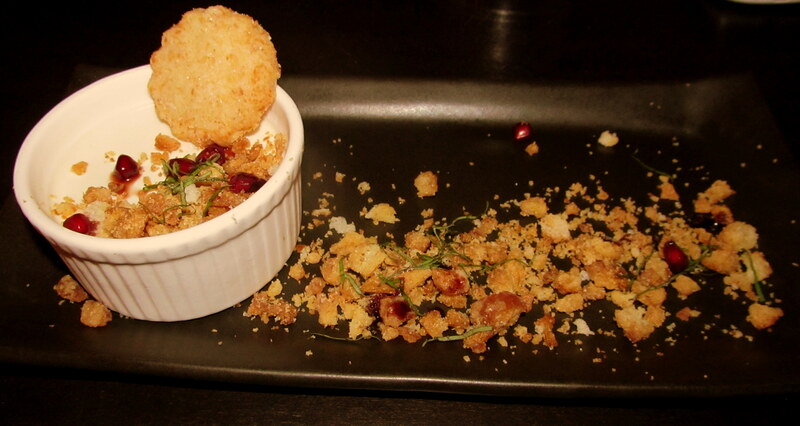 We ordered – Panna cotta (coconut, lemongrass, kaffir lime) and a creme brulee (nutella, white chocolate). My hubby had a bite of each and asked me to finish them off – if I wanted. Panna cotta was really bad. 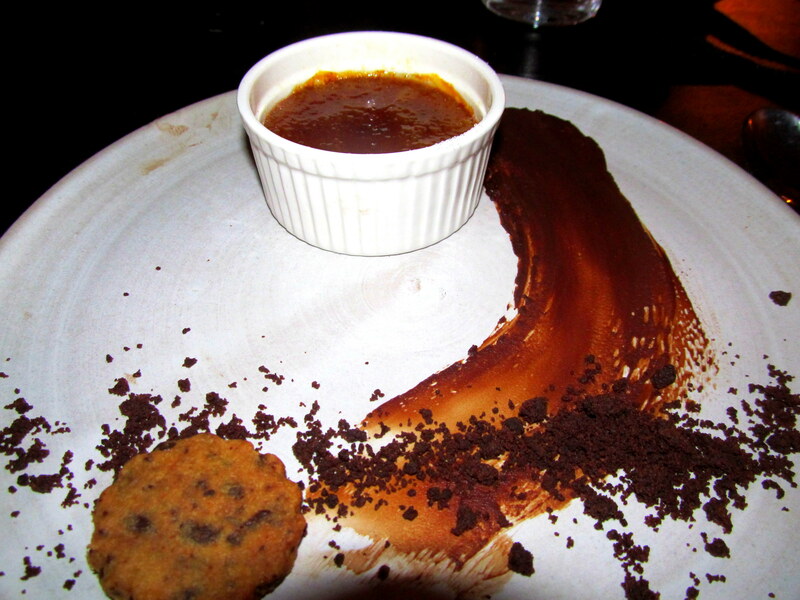 For the creme brulee, if I would have been offered a ramekin of pure Nutella, I would have felt happier. … FULL STOP. THE END. 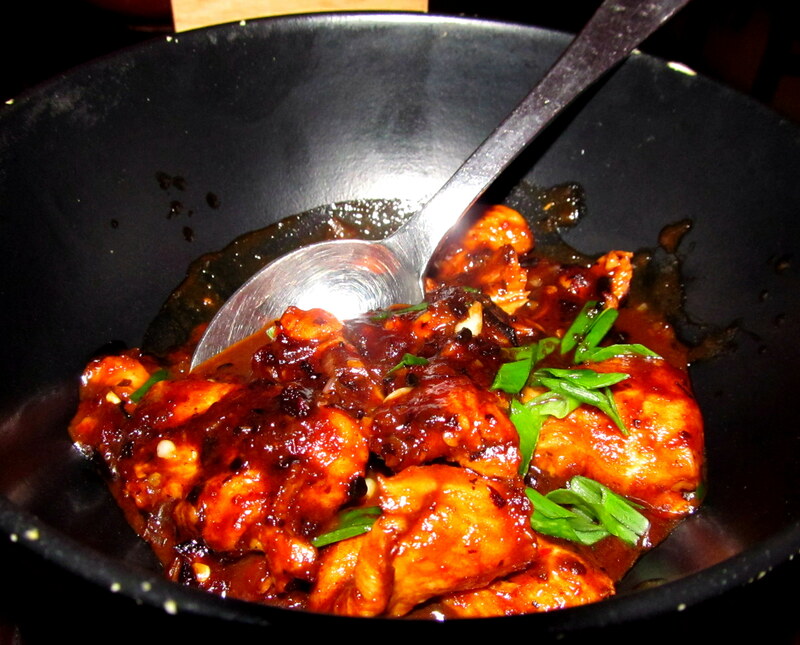 Went to Shiro for dinner Tuesday night. I like the place. I think I go there 2-3 times a year. 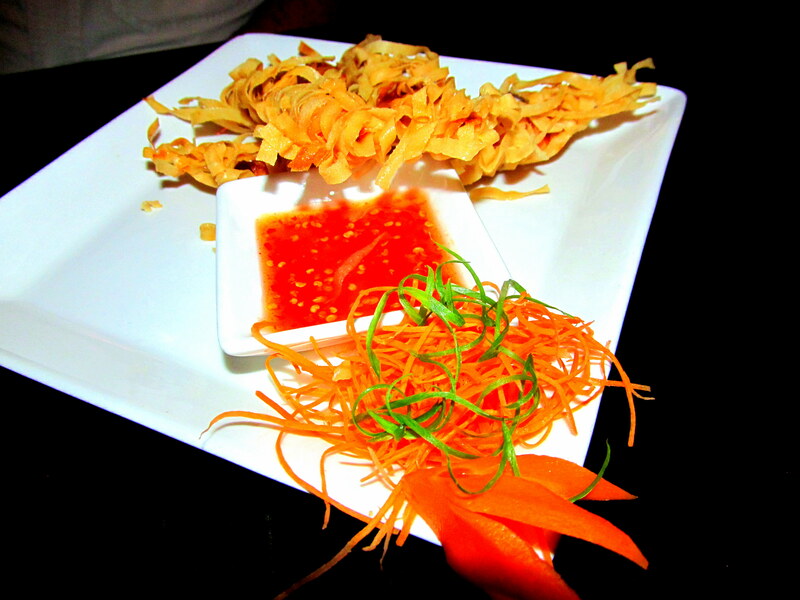 The menu is extensive and taste – very interesting. 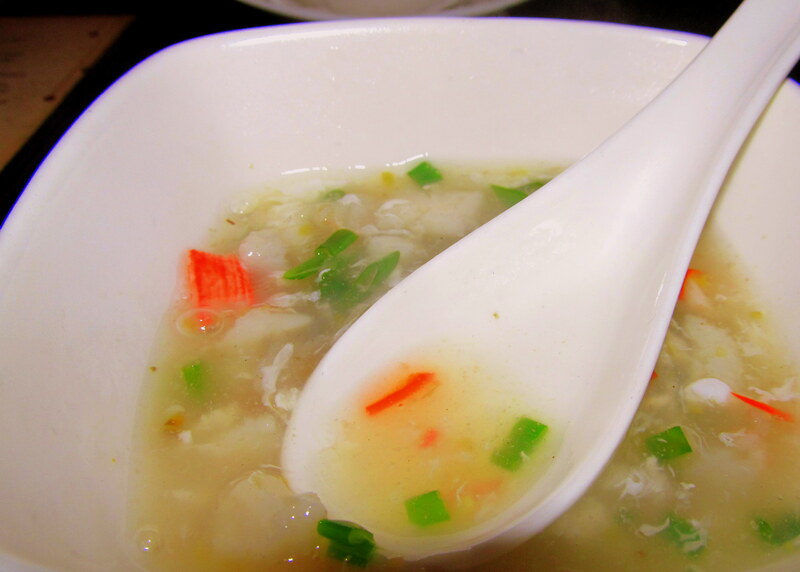 My order for the night was Chili Lemon Soup – a clear tangy soup with a subtle hint of shiitake. Very good. 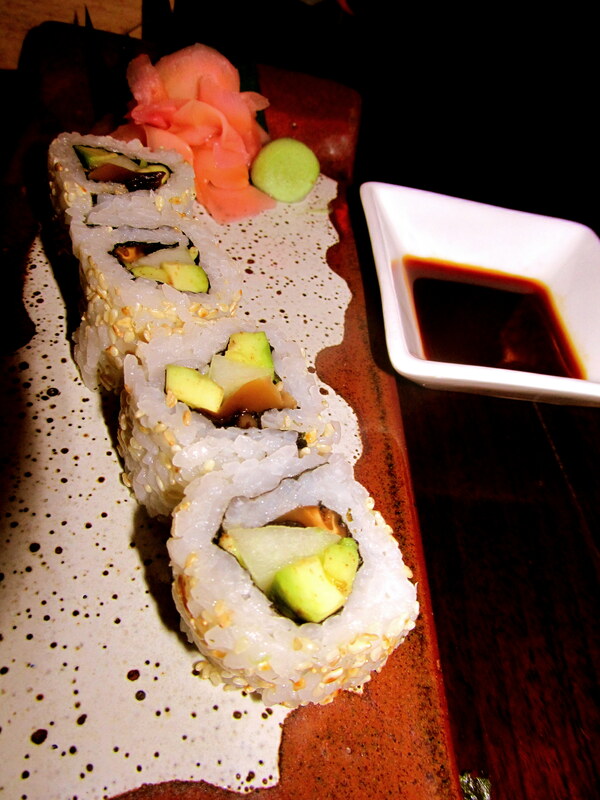 Appetizer – Vegetarian spicy California maki – Shiitake mushroom, cucumber & avacado in spicy Vietnamese sauce. Duck the sushi rolls in the dip and its nice. Loved the ginger pickle and wasabi alongside it. Mains – Seasoned Korean styled tofu with vegetables and Yaki Udon noodles – The veg Yaki Udon noodles are Japanese stir fried noodles and vegetables in teriyaki and oyster sauce. 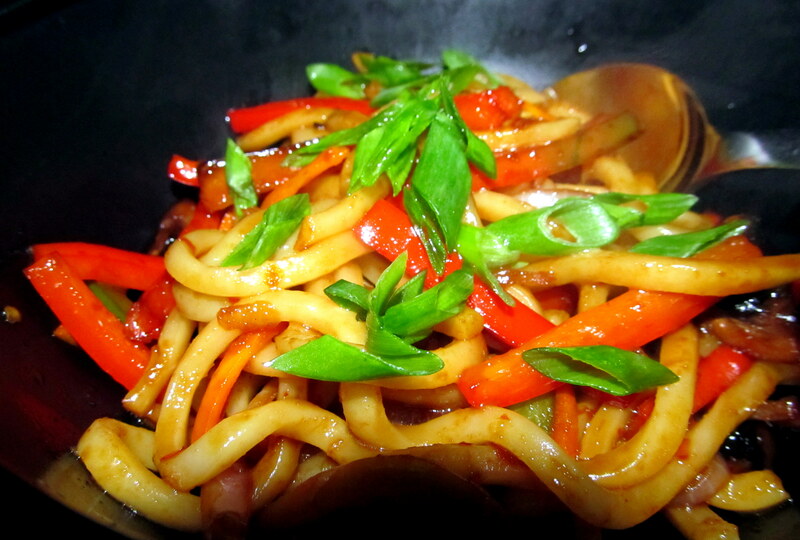 MUST ORDER – THE UDON NOODLES. They are well flavoured and can be had by itself. 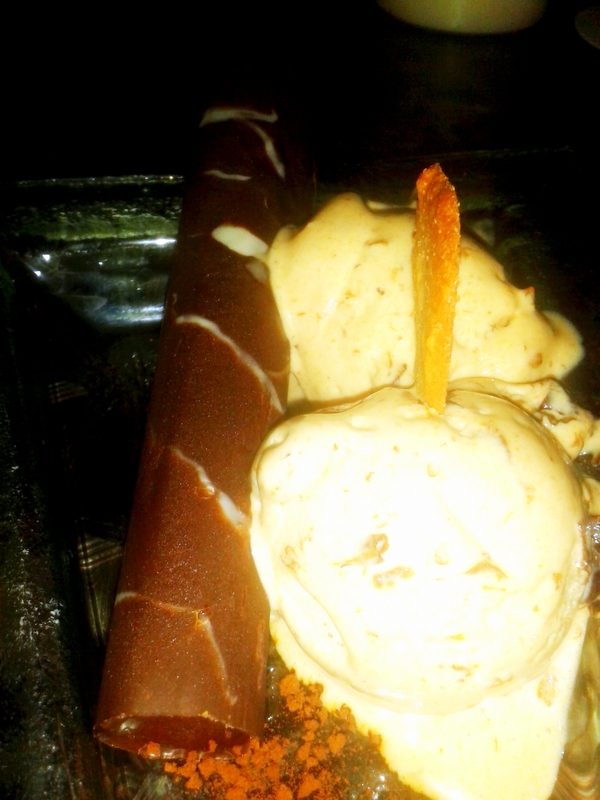 Dessert – Chocolate Sushi – a selection of sushi, flavoured with Bailey’s and Kahlua. 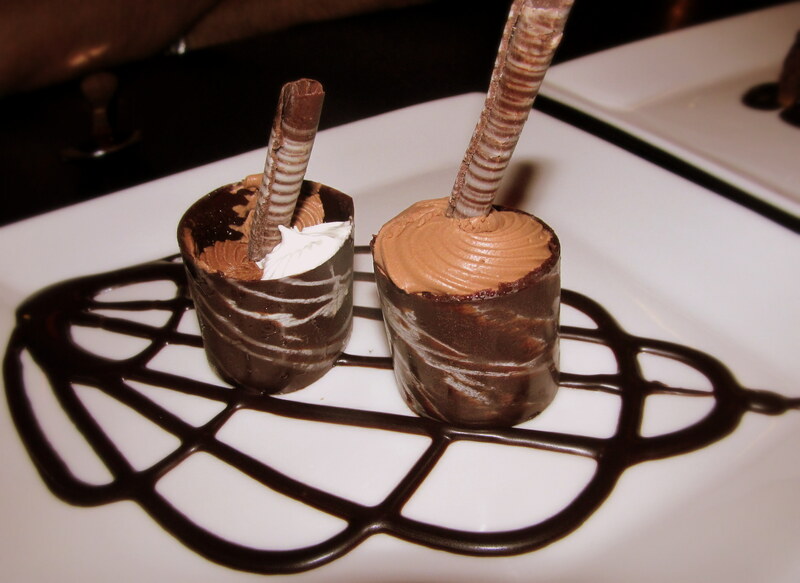 Another MUST ORDER – Its alcohol flavoured mousse filled in finely made sushi rolls. 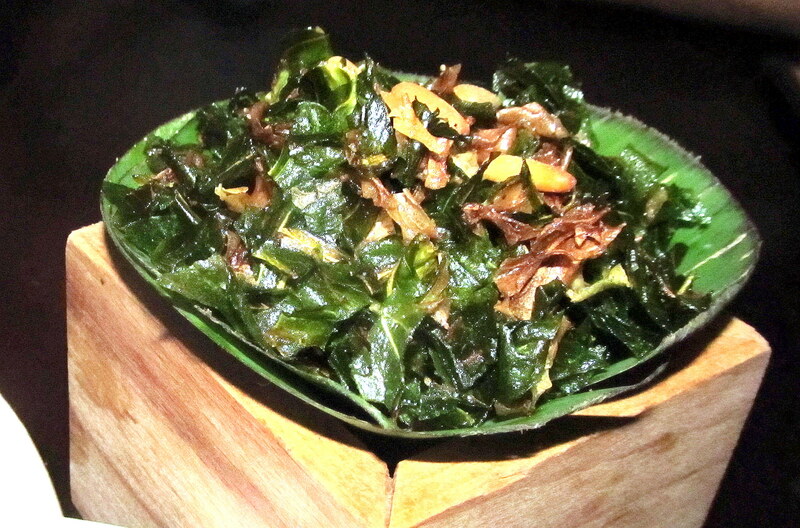 Complimentary were the crispy seaweed – interesting as I have not had something like this before and the side portion of stir fired vegetables in chilies and basil is excellent. All the photos you see above were only for me! Awesome. I tried to do justice to the meal but just could not finish the some of the mains. The noodles and dessert serving plates, of course, were cleaned-out! Now, my partner’s meal. 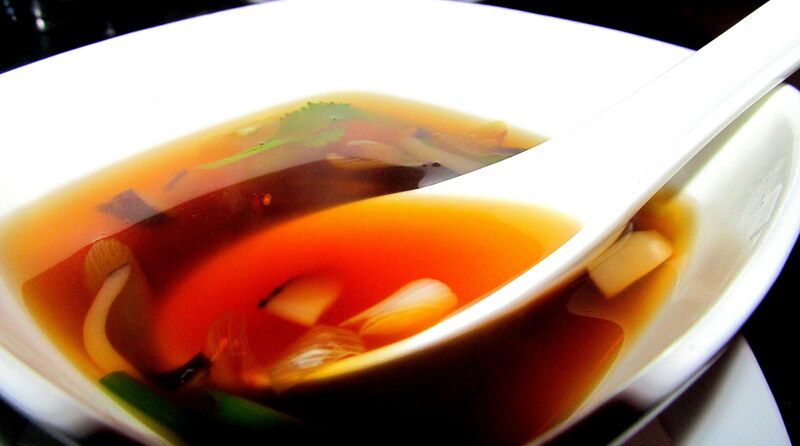 His order was Thai Kwai soup – very well made. 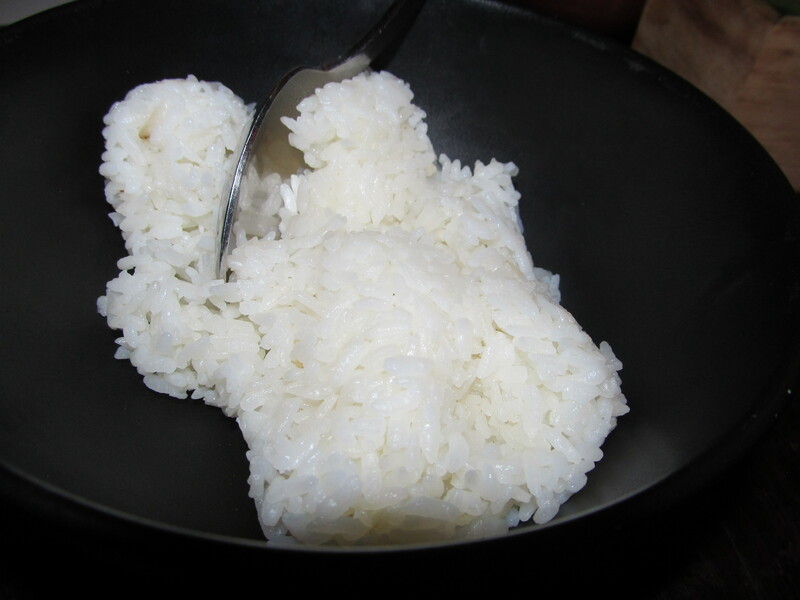 Seasoned Korean styled stir fried chicken and Japanese steamed rice. Well flavoured. 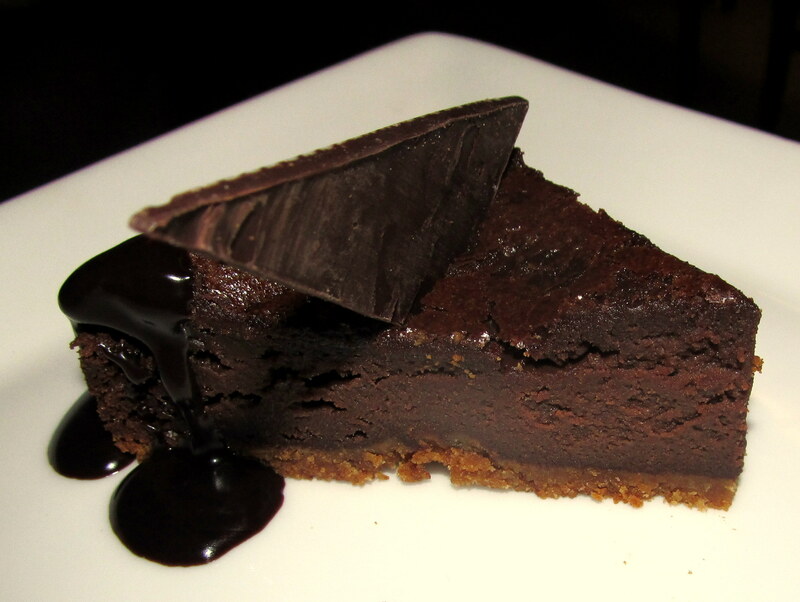 Misissippi mud slide – good chocolate mudpie but it required another ladle of chocolate sauce. Stuffed after a 2 hour long dinner, we drive back home – to sleep. A well enjoyed meal – thanks to Restaurant Week. 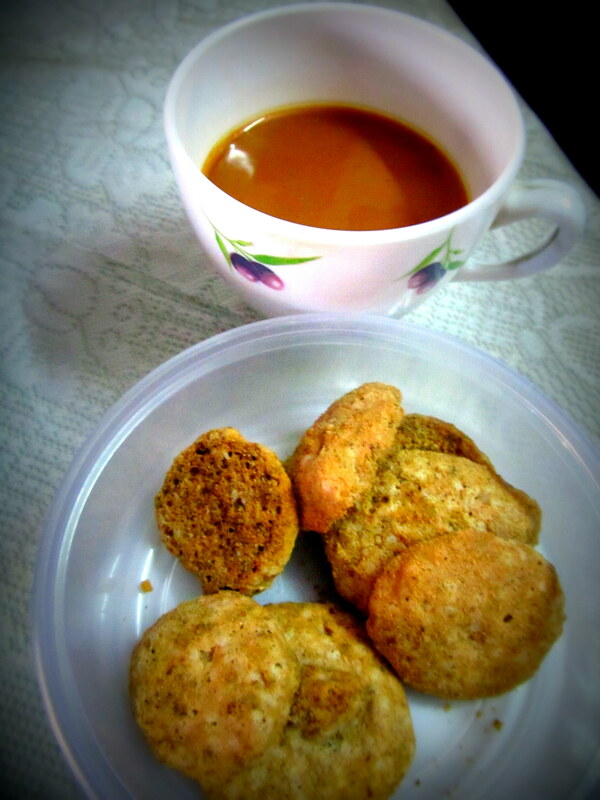 My neighbour gave me some cookies from Merwans. They were yum. I couldn’t believe they were from Merwans. They are Walnut crunch cookies. A packet of 250 gms at Rs. 180. Fantastic. Makes a lovely partner with evening tea. I love the ambiance of this place. The vibe is just great. I was introduced to this pub my by hubby. It had initially opened at Phoenix Mills, Lower Parel. At the time, I had a drink and ordered a portion of nachos. Wow – the quantity of the nachos was so much that, that was my dinner! 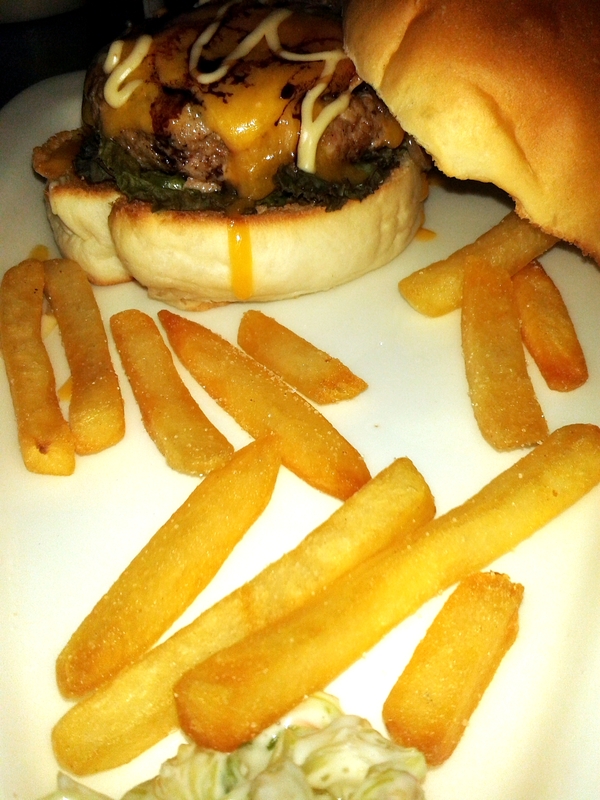 Irish House opened another outlet at Kala Ghoda a few months back. I went there recently. 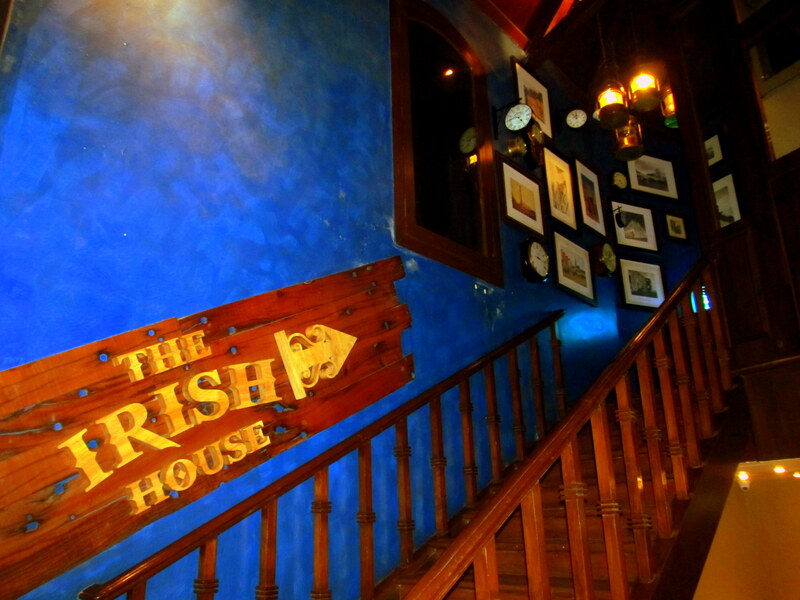 I love the character that Irish House brings forth. Its warm, classy, chic, comfy, soothing, electrifying and relaxing – all at the same time. 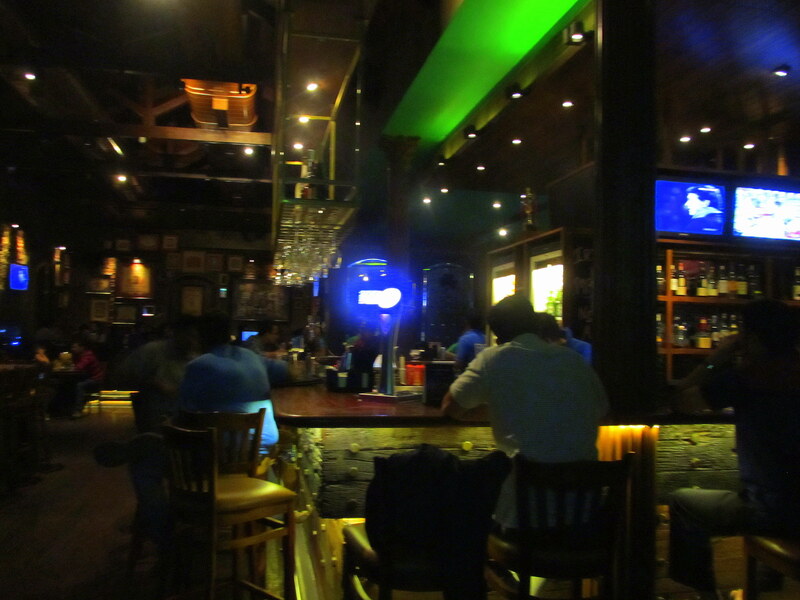 The outlet at Kala Ghoda has a larger space and like its Lower Parel counterpart, sports a huge screen. The music is fantastic – hats off to the DJ please. As luck would have it, we reached there just before Happy Hours were ending. Buy 1 get 1 free. 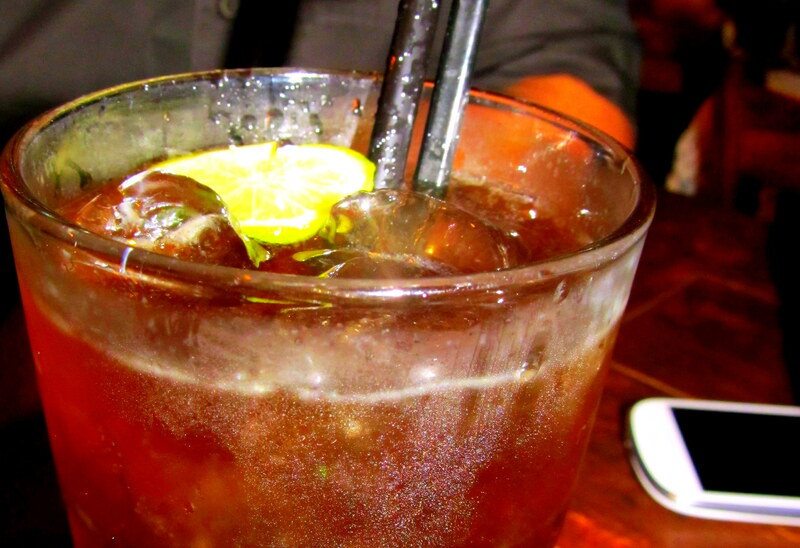 Ordered a Long Island Ice Tea. 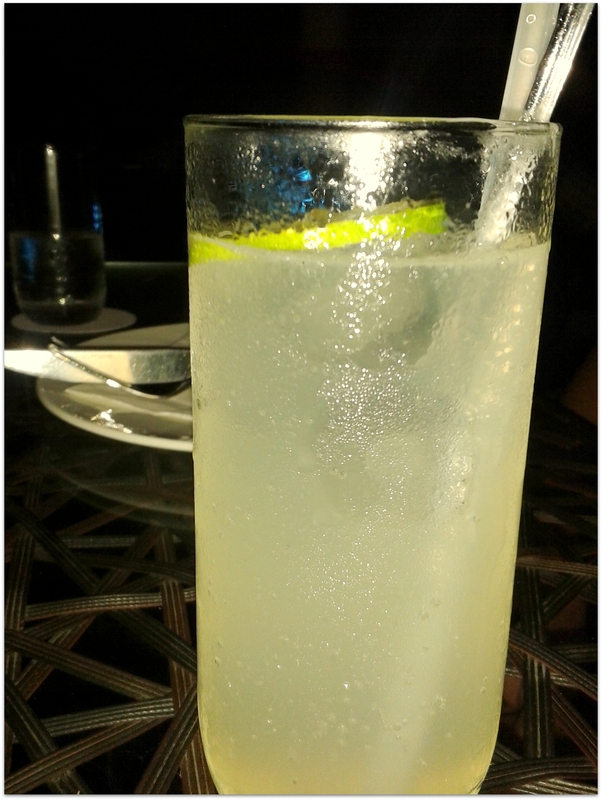 Hmmm………..the drink was disappointing. Priced at Rs. 595, we’ve had better. To go with this, we ordered the Ultimate Cheese Combo. 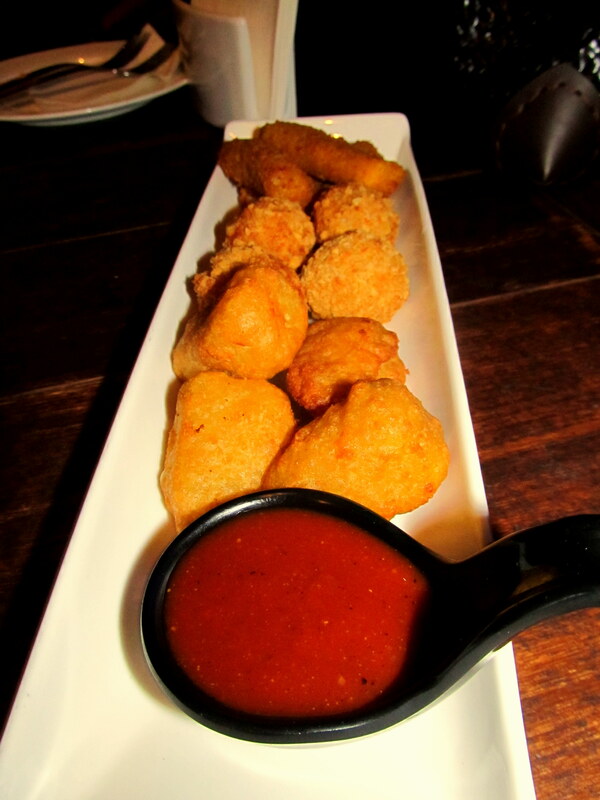 This is a platter of 12 pieces of 3 types of cheesy delights. Starting from the closest to the farther-est, they rated themselves similarly. Closed to the sauce are the Jalapeno Poppers (which were the best), followed by Breaded Sharp Cheddar Cheese Ball (nice) and lastly the Mozzarella Sticks (average). At Rs. 395, they paired well with the drink. Main course was Moussaka Veg. Price is Rs. 375. 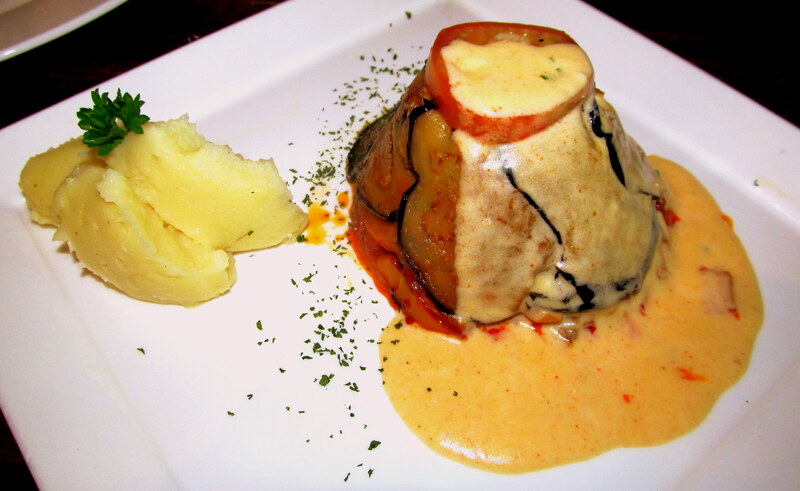 Its well flavoured and served with potato mash. 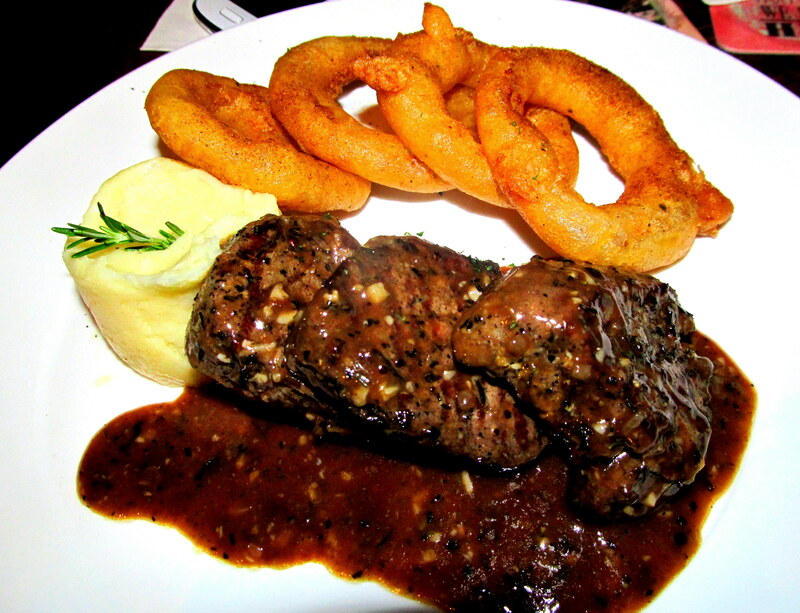 The Three Lion’s Steak & Chips was a good meal too. Priced at Rs. 575 it got an almost 4 on 5. Both dishes were served with potato mash and must say, they do make one of the better mashes I’ve eaten. Overall rating would be a 4 on 5. They get this because of the ambiance they have created together with prompt service. If only food was to be considered, then it would get a 3.5 on 5. The drinks are on the expensive side, apart from a few starters, portion sizes are small ( for eg. Mini Tacos at Rs. 275 are 8 pieces of bite-sized tacos) and the Cigar rolls are just 5 pieces.) However, the main course is appetizing. To all the prices mentioned above you need to add 10% of service fee that they charge as well as the taxes. I used this pack to make dinner for hubby last night. As usual, the taste was perfect. I have used a few more products from Shan’s collection and they turn out faultless every time. Just follow the recipe mentioned on the pack behind and you can’t go wrong. I recommend this brand of ready-to-cook masalas for all, especially those living alone or for those vegetarian persons who cook non-vegetarian dishes for their non-vegetarian partners / family members. Its hassle-free and easy to cook. I made this Chicken Masala dish for my hubby’s dinner last night . 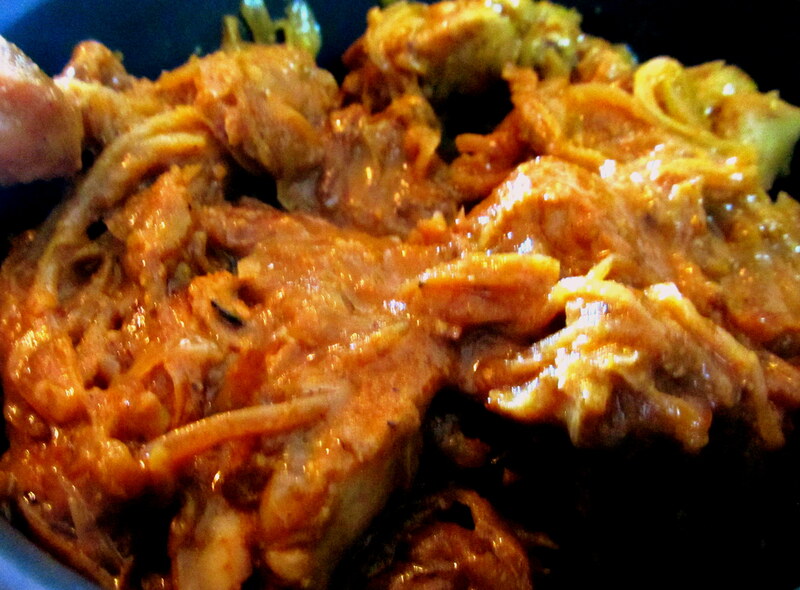 This is a thick onion gravy with chunks of chicken. 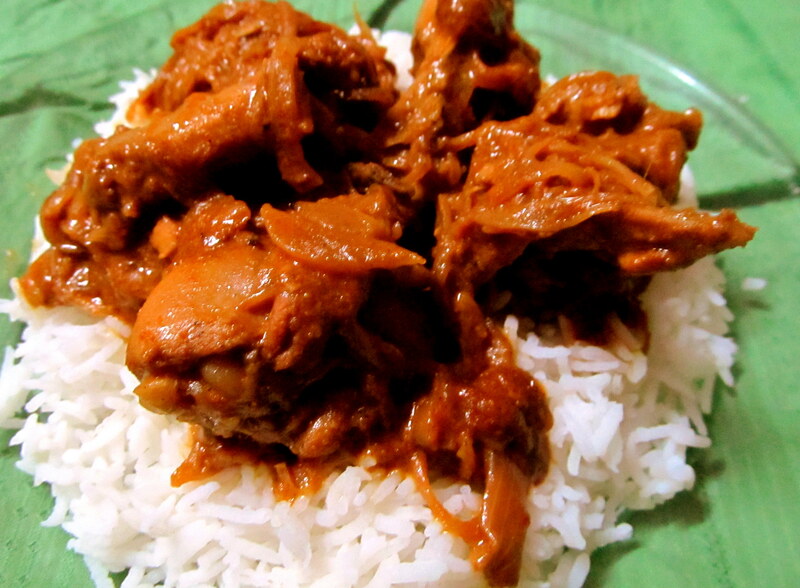 Its a spicy masala and is ideally to be had with roti or naan but hubby prefers it with rice. 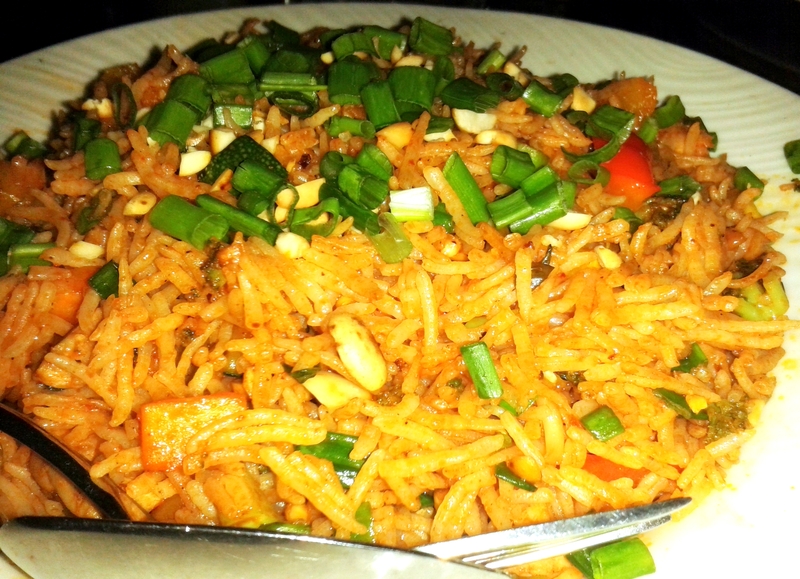 I used Chicken Masala from Shan range of ready-to-cook masalas. 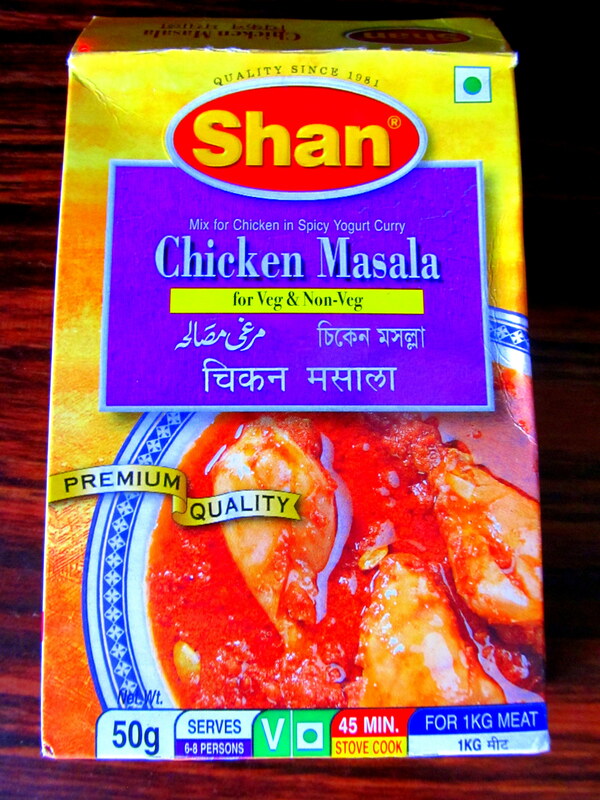 (for more info and pictures on the Shan masala I used, see following post). 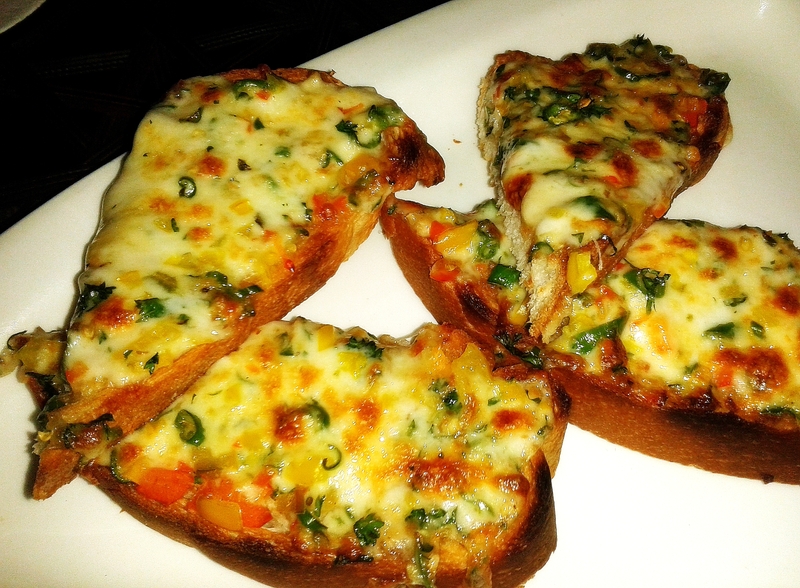 I must say – I am extremely happy with Shan products as they turn out perfect every time.